K & R Services saves you time and gets important tasks done with confidential, timely, professional administrative and virtual assistance. so life works better for you"
1. 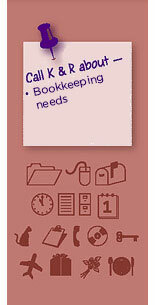 How can K & R Services Unlimited help me? We offer you less stress, and more time. At K & R Services Unlimited we specialize in handling a wide range of services for both home and office, customizing our services to meet clients' specific needs.. You can trust that our services will be reliable, timely, efficient and friendly. 2. How do I request service? You can e-mail, fax, or call us via telephone. You will be called back within 24 hours of your request. We will also do our best to accommodate any emergency requests. 3. Is K & R Services bonded or insured? Yes, K & R Services is both Bonded and Insured for your peace of mind. 4. Is the information about myself confidential and private? At K & R Services we understand the importance of your privacy and confidentiality. It is very important to us that our clients feel comfortable and secure with us, and are happy to answer questions you may have about our standards. We currently accept Cash, Check, Paypal. We plan to offer payment by credit card in the near future, and will keep you posted. Payment is required upon completion of services. Deposits are required on hourly monthly volume, special projects and new clients.